My theme for this month appears to be all about making things easier with getting 4 kids off to school. This one is about breakfast. 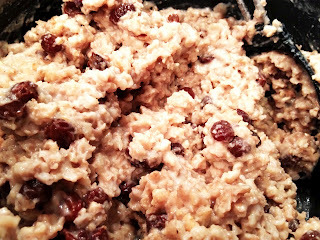 My kids like oatmeal - but they would gladly eat the instant stuff every day. I do resort to that sometimes, but I really am trying to avoid it. I am really trying to focus more on real foods, more whole foods, less processed foods, no refined sugars, etc. So instead - I make up a big pot of real cooked oatmeal, but this one is already flavored and doctored up and all ready to go - so all I have to do is re-heat and serve. Maybe even easier than tearing open the package and adding hot water - and certainly better. This is a big pot - I'm thinking it should get us through the school week, you could certainly cut it down. This picture really doesn't do it justice. I'll try and take another. But you can see how nice and plump the raisins get.